Hidden Express collection of cheat list and hints to follow, for beginners and intermediate level. I compiled all the hints in the game and categorize it. If your a newbie this is a good place to start and if your a long time player you might learn something that you didn't know that exists. This is a very interesting game probably the only hidden object game that use real photos with wide variety of stages and levels that will keep you playing. The faster you find objects, the fewer objects you need to find to reveal the locomotive. Super Sleuth Charm: This gives you 3 extra hints per play. Super Sleuth Power-Up (magnifying glass): Reveals the location of a random object. You do not need to "use" charms. Once you buy them, they are automatically in effect. As soon as you see the Locomotive, attempt to find it's hidden object. Bonuses from remaining boxcars will lead to higher scores! TIP: Generate combos as quick as you can to get high scores! Pro tip: When you have a bonus car on the screen, the train is slowed for 8 seconds. Use some of that time to find the next few objects. As soon as you find the engine object, each remaining boxcar is worth 10,000 points. The more cars left on the train, the better! Replay a level as many times as you need in order to master it. Photographic memory can be trained! Any time you find 5 objects without letting the combo timer expire, you will see a bonus car worth up to 12,000 points! Hurry up it only lasts 4 seconds! You need to clear the LOCOMOTIVE to unlock the next level. Visit the Shop to Buy Power-ups and Charms! When you have a bonus car on the screen, the train is slowed for 8 seconds. Use 3-4 of those 8 seconds to memorize a few objects to find. This will allow you to find the next few objects very quickly and lock in the next combo, slowing the train again. Repeating this technique keeps the train from advancing, allowing you to find the engine object sooner. Make sure you count how many times a bonus cart lights up - say three times, so - after the second time hit three carts to the left and then two directly behind the engine, you should get success this way and the engine will then light up. It takes a bit of practice, but it does work in the end. And go in with as much energy as you can. Also, don't forget, some scenes you need to leave as many carts over once you reach the engine as you can, as each one left is worth 10k points, and can mean the difference between no stars, and three stars. Tickets are the currency used in HX (Hidden Express). They can be used to buy power-ups and charms. Earn Tickets by mastering certain cities (earning 3 stars on every level). Earn Tickets by logging in daily. On the 7th consecutive day, you will earn 2 tickets! Up to 35 gifts can be stored in your message box until you need them. Play in This Week's Tournament and Win Prizes! Compete with friends by playing Tournaments! 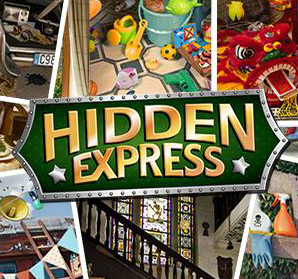 Every consecutive day you play Hidden Express, you'll receive a free gift. Remember to play tomorrow to start receiving your first reward of Energy! You can win Golden Miles by replaying levels you have not yet mastered. Win 50 Golden Miles by fully mastering all ten levels in a City, and also gain that city's pin! Golden Miles can be bought using HX Tickets or earned by completing full city mastery. Whenever you're ready to use an Energy Pack, click the "Use" button under the pack you want to use. Energy packs will stay in your inventory until you use them. 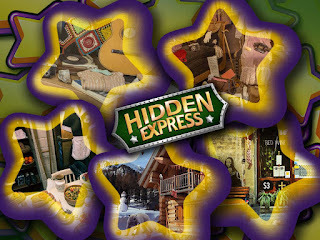 Hidden Express is the only hidden object game shot on real locations with photographed objects. For more bonuses use the Hidden Express Free Bonus page. It's a very useful specially when you did not play the game for a long time, it simply track the bonuses that you haven't collected yet and other non facebook friend gifts. In the Tailor SHop I'm confused as to what a dog patch is. I've found all the tiny weird stuff except that. The 5 is on the bistro chair seat. Like Five on a die (dice) and the playing card is the Canopy above the bistro window. It's the decorated playing card part, not the face side. Can anyone help me find the Five and the Playing Card are in the Creperie?